First off, question, ebook, e-book, or eBook? I'm leaning towards eBook. To me is suggests "electronic book" while the other two both look like they should be pronounced "eb-ook" to me. At some point now I will have to name a fantasy character Ebook (pronounced Eb-ook) just for the heck of it. So, anyway, I did go ahead and raise my eBook price from $1.99 to $2.99 as mentioned in my previous post. Since then I have made two new sales, which is about average for me. Not an up-swing by any means but definitely not a down-swing. So I do not think it has adversely affected my sales in spite of the dollar increase. Also, with the 70% royalty rate that this price increase allowed me to implement, I now make about the same profit from one book that I previously made from selling three. 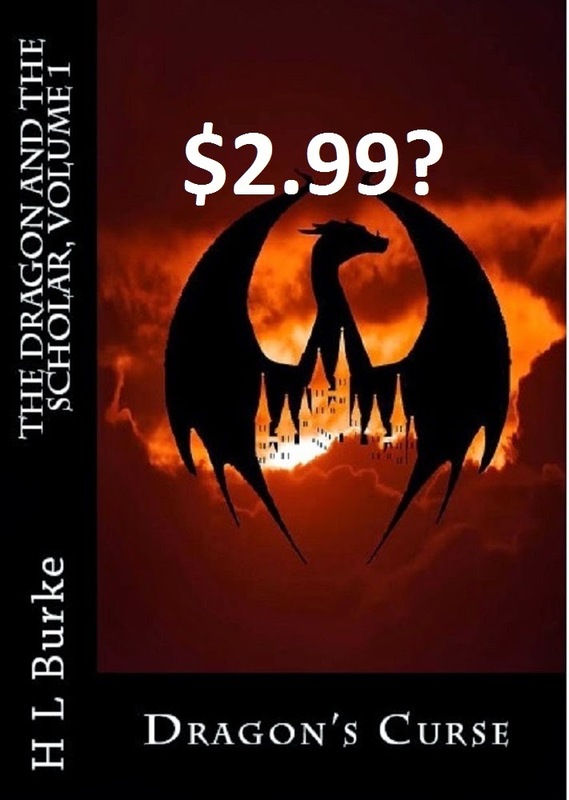 I'm not sure if I made the right decision, putting my book up for a lower price until it got some reviews, or if this did not make a difference, and I would've eventually gotten those same sales (and reviews) at the $2.99 price. My thought was as an unknown I had to draw people in with a lower price point to convince them I had something to offer. I've gotten eight reviews and Dragon's Curse carries a 4.6 star ratings average on Amazon. I'm happy with that. I feel readers can take a chance on me (and now I have an ABBA song stuck in my head. GET IT OUT! GET IT OUT! ).